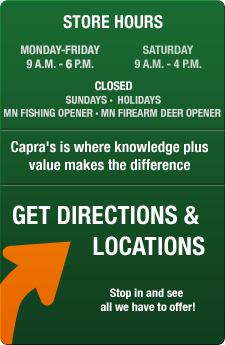 Capra's Outdoors is a factory authorized service center for Minnkota electric trolling motors. Needless to say, we know trolling motors! Since 1980 we have sold their entire line up of motors, as well as servicing them and installing them. Beyond that fact, if you look at any of our Pro-Staff's boats you will see at least one, and in some cases two trolling motors professionally installed on them. Simply put " We know trolling motors!" and can expertly recommend the best motor in terms of size, shaft length, and model applicable to your boat and fishing style. If you can't find what you're looking for on the website, chances are we have it in the store or can order it from our manufactures. Give us a call at 1-877-780-4557 and we'd be happy to help. Upgrade your motor with the innovative, intuitive CoPilot wireless remote. Get precision boat placement and the ability to stay on the fish as long as you want with a DeckHand™ electric anchor winch. It automatically raises or lowers your anchor at the touch of a button, and its special anti-drag system senses the bottom to allow for controlled drifting. Each standard DeckHand model runs on a 12-volt battery (not included) and features a 2-year warranty. The powerful, rugged construction of the Edge gives you the power to go up against stump fields, tangled weedbeds, and strong wind and waves to get to where you want to be: where the fish are. The legendary Endura™ C2 is built to explore, built to last and backed with a three-year warranty. Form and function unite for a dependable package that'll get you where you need to be on the water for years to come. Endura features an ergonomic, six-inch telescoping handle for comfortable, easy steering, and the unique bearing system reduces friction -so they’ll never hear you coming. i-Pilot Link System allows your Minn Kota PowerDrive V2 or Terrova trolling motor to communicate with your Humminbird fishfinder and LakeMaster digital GPS maps – opening up a new universe of navigation capabilities. The integrated system delivers automatic boat control and the ability to store and revisit your best fishing spots. Plus, you can take control from your Humminbird or the full-color LCD screen on the Link remote. i-Pilot® changed the game again...An ergonomically redesigned remote. Double the memory for Spot-Lock (now with 6 spots) and Record A Track (now with 6 tracks).